The sprawling Refinería del Pacífico is an enormous industrial complex stamped out of the tropical forest in Ecuador. So, when herpetologists discovered a new species of snake outside the petrochemical plant's gates, their minds went immediately to the underworld. And thus, Atractus cerberus was born. 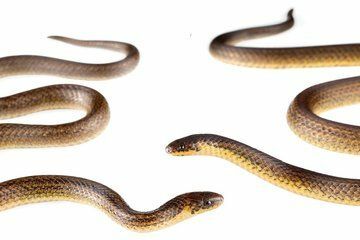 The brown-and-yellow ground snake — named after Cerberus, the mythological three-headed hound who guards Hades, the god of the underworld in ancient Greek mythology — is one of three new serpents discovered in Ecuador. All three newfound species are members of the genus Atractus, a secretive bunch that tends to evade scientific scrutiny, said Alejandro Arteaga, the scientific director of the conservation organization Tropical Herping who co-discovered and helped describe the new snakes. The team collected 39 individuals from more than 20 species to build a genetic tree of serpentine relationships. Their results, reported March 15 in the open-access journal ZooKeys, revealed that at least 27 species of Atractus live in Ecuador. Three of those species were new to science. Two specimens of A. cerberus, the only individuals of this species ever found, were slithering on leaf litter and crossing a forest trail, respectively, in the only patch of woods left around the Refinería del Pacífico. Given the fractured habitat and the fact that this species has never been found elsewhere, the researchers determined that it is probably a critically endangered species. The Cerberus ground snake, as the researchers are calling it, is brown with a yellow belly and grows to be about a foot (309 millimeters) long. Thin, black, dashed stripes run lengthwise down its back. In contrast, the other two new species of ground snake sport bolder color patterns. Atractus esepe is now known from two specimens found in an evergreen lowland forest in the province of Esmeraldas. These snakes grow to be about 9 inches (232 mm) long and have white bellies and brown backs dotted with darker and lighter spots. The researchers named the species in honor of the Spanish pronunciation of the scientific abbreviation for "species," "sp" (AY'-say-PAY'). For its common name, the researchers call the new species the indistinct ground snake. The final new Atractus species is the Pyron's ground snake (Atractus pyroni), a single specimen of which was found dead on a dirt road running through pastureland and the remnants of cloud forest in Ecuador's Bolívar province. The snake was more than 17 inches (443 mm) long and had black scales with two block-like yellow stripes running along its back. The name of the snake honors R. Alexander Pyron, a herpetologist at The George Washington University. Atractus species can be hard to find and are often discovered lurking under rocks and logs in the Andean highlands, Arteaga said. But they're particularly hard to find in leafy, dense forests unless they are crossing roads or paths. Understanding the group is important, he said, because their larvae-eating ways may be a crucial part of the tropical ecosystem.